And this is why they live underground. The Pink Fairy Armadillo is one part warm fuzzy, one part cold prickly. The plates of armor-like skin protect this lilliputian armadillo species (~4 inches) against abrasion whilst digging underground, where it spends nearly all of its time. The supremely creepy animal is currently endangered in central Argentina, where it is found. they are sooo cute i cant belive i have never seen them before!! 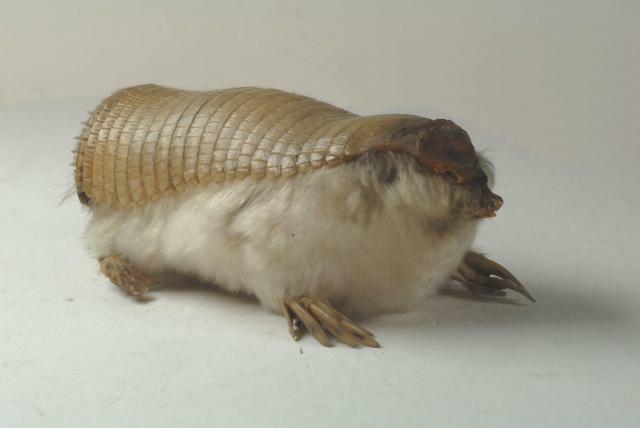 Looks Like A Guinea Pig With Armor On Its Back And Claws Stuck On It. They are not extinct, Sam but you certainly don’t want one for a pet. They carry leprosy. i hafta to a project on this animal.. & its wierd. It looks like a Narnia animal -wearing its armor! Let me tend the rabbits george, i’ll feed them alfalfa.